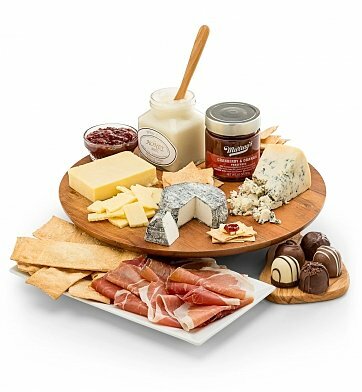 What's better than sharing delectable cheese boards and charcuterie with the ones you love? Each artisanal cheese is cut-to-order by world-renowned Murray's cheese makers, gently wrapped in specialty paper and shipped with ice packs to preserve its perfectly cool condition. Presented in a rustic wooden crate, it's a gracious offering for those with excellent taste. Jan's Farmhouse Cranberry & Pistachio Crisps. Each item in this gift is securely wrapped in an enduring signature wooden gift crate, with ice packs to safeguard the shipping process. A complimentary card with your personal message is included with your gift. Contains 2.5 pounds of cheese and 9 ounces of meat. Cheese Tasting Celebration is a hand delivered gift. These gifts are delivered by one of our local design centers located throughout the United States and Canada. Same day delivery is available for most gifts when ordered before the cutoff time. The cutoff time for Cheese Tasting Celebration is 2 AM in the recipient's time zone. A delicious, shareable journey through tastes and textures of cheese, meats, olives and honey. Cheeses arrive securely arranged in a wooden gift crate. Cheeses are cut-to-order and wrapped in specialty paper. Contains gel ice packs to safeguard the shipping process.